Tysons Corner, Virginia – The Design-Build Institute of America Mid-Atlantic Region (DBIA-MAR) has awarded Manhattan Construction Co. and design partner, AECOM, with the 2011 Design-Build Merit Award in the Civic Facilities category for construction of the US Army Corps of Engineers Museum Support Center project at Fort Belvoir, Virginia. The award presentation held November 17th at the DBIA-MAR annual meeting and dinner in Tysons Corner, Virginia. The Museum Support Center facility provides archives and record storage to support the Army’s network of museums worldwide. The 124,775-square-foot, one-story facility includes collections storage, processing and research areas, spaces for exhibit fabrication and artifact conservation, administrative support spaces, and public research areas. This project has also earned LEED Silver certification through the U.S. Green Building Council. 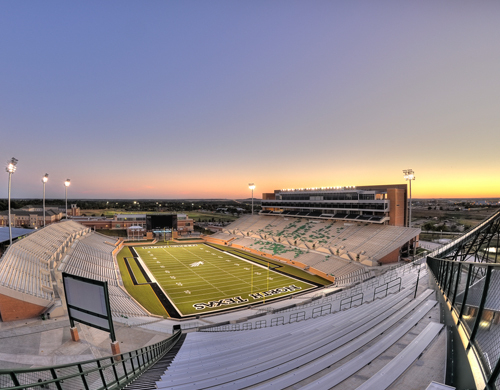 Denton, Texas – The University of North Texas (UNT) Apogee Stadium, built by Manhattan Construction Co. and designed by HKS, Inc., has earned LEED® Platinum certification and is the first collegiate stadium in the nation to achieve this green building designation. LEED Platinum is the highest certification level in the LEED green building certification program administered by the U.S. Green Building Council (USGBC). Among Apogee Stadium’s green building features are the three wind turbines which provide renewable energy to the stadium facility. During construction the Manhattan project team recycled 75 percent of construction waste. Of the products and materials used in the construction of the stadium, 20 percent were made with recycled content and more than 47 percent were manufactured locally. The 340,000 square-foot stadium will serve as a diverse venue for the community, hosting outdoor concerts, high school games, and band competitions for the entire North Texas Region. The newly constructed stadium will seat 30,000 fans and has the capability to expand to accommodate up to 50,000 seats. The impressive structure also includes 760 seats at Club Level with food / beverage service available and 21 luxury suites, custom built for comfort and entertainment. Manhattan completed construction within an 18-month schedule and on time to kickoff the 2011 football season. LEED, or Leadership in Energy and Environmental Design, is an internationally-recognized green building certification system. 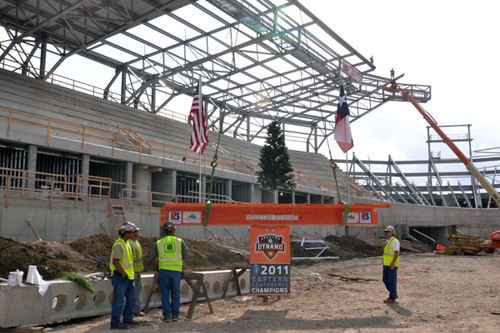 Houston, Texas – Manhattan Construction Co. placed the final, upper most piece of steel, otherwise known as ‘topping out’, at the Houston Dynamo Stadium on November 14, 2011. The brightly painted orange beam was set into place in the canopy covering the east side of the bowl. The stadium is 45% complete with 5 ½ months to opening day on May, 12, 2012. The project has been moving at an extremely fast pace since breaking ground March 01, 2011. When the stadium is finished it will hold approximately 21,600 fans and will play host to Texas Southern University football games, boxing matches and concerts besides Houston Dynamo Soccer games. Manhattan Construction Co. has 45 subcontractors consisting of more than 200 people working onsite to complete the 34 luxury suites, 1,000 club seats, and overall 22,000 seat stadium. This project is LEED registered with the U.S. Green Building Council. The Houston Dynamo moved to Houston in 2005. Since then they have won two MLS Championships. Sunday, November 20, 2011 they will complete in their final game for their third MLS Championship. You are currently browsing the Manhattan Construction Group blog archives for November, 2011.